Oak from English forests has been used in building construction for many centuries and original oak beams continue to support structures more than 500 years old. The popularity of English oak can largely be explained by the availability of the trees and durability of the wood. As a natural building material, oak is extremely hard to destroy: large sections will resist fires intense enough to melt metal and will flex to accommodate the natural movements of a building. Although English oak stocks have been depleted over the centuries by various wars and the industrial revolution, there continues to be a healthy supply of logs from private estates and, to a lesser extent, the Forestry Commission. With an increasing emphasis on sustainable forestry and general good practice among forest owners, we believe that oak forests will continue to thrive in this country. However, where specifications demand, Vastern Timber also sources oak logs from well-managed woodlands in France. Oak beams are usually cut from trees between 90 and 120 years old, ideally felled during the winter when the sap is down. 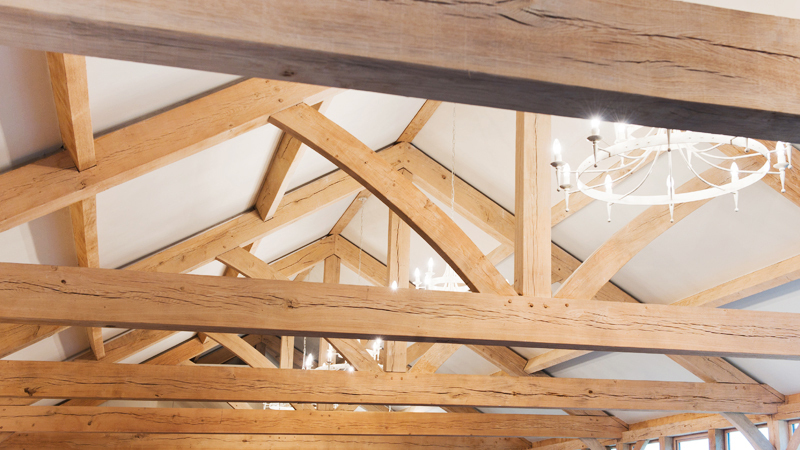 The beams for construction tend to be fresh sawn or green which means that they are in fact wet and while this is of concern to many architects because of oak’s natural tendency to shrink and split, it is the ideal way to use the timber. It is easier to cut joints and peg holes before cracks have appeared in the wood. Using green oak has a lower environmental impact than dry oak. Dry oak is very hard and therefore difficult to work. Trying to cut and drill dry oak will blunt tools and exhaust arms very quickly. Oak dries very slowly and is consequently very expensive: a large beam can take 8 – 10 years to fully dry. There are no standard framing sizes and it is therefore difficult to predict which sizes and lengths will be required years down the line. Working properties Green oak is generally easy to work but becomes increasingly difficult it dries. Insect attack The ambrosia beetle can attack the wet timber (30% moisture +). However, the beetle will die as soon as the wood dries to less than 30%. Re-infestation will not occur. Other dry wood will not be affected. Sapwood is commonly attacked by the powder post beetle (Lyctus spp). However, sap is normally excluded from oak beams. and anything else it comes into contact with. All fixings used in conjunction with green oak should be stainless steel.